This is a short extract from the main book and also the mini-book: Why do smart people make such stupid mistakes? It’s dumb not to learn from our mistakes. It’s dumb not to observe, reflect, think and change your behaviour when you can see a particular action or strategy isn’t working well. So why do we find it so hard to learn from our ‘negotiation’ mistakes? Is it habit, pressure or the wrong mindset? I’ve worked with many really smart people working within agencies and in sales-teams of many leading companies. However I see the same mistakes being made in many of these companies repeatedly. Many of the strategies are common sense, yet they often aren’t common practice. How well do you hold your price? Clients and customers will challenge your price. It’s part of their job to challenge your price. However price crumbling too quickly will cost you dearly. The more you drop your price and the quicker you drop your price the more the client will expect you to drop your price even further. Clients will see your behaviour to drop your price not as generosity but that your original price was over-inflated or had so much fat built in that you could afford to give away so much profit. Does this mean you should never drop your price? Of course not. However, there are specific strategies to apply if you do choose to drop your price. Studies show that for most businesses a 1% drop in price can impact profitability by around 10%. During the recent recession several agencies told me their clients had threatened them that they had to reduce their fees by 20%, 30%, 40% and even 50%. If you are over-dependent on that client you are left with little alternative but to comply. Most people price crumble – often in the belief that they will lose the deal unless they drop their price. 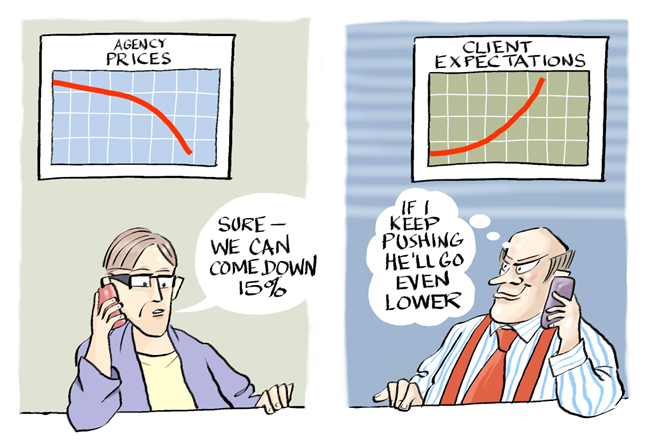 The paradox is that the more we drop our price the more the client wants us to drop our price further. So will we lose a deal if we don’t drop our price – maybe, maybe not? Dropping our price too easily creates mistrust and can seriously damage the relationship. The more we drop our price to secure the deal the more suspicious the client becomes and the less value they attach to the deal. If you don’t believe in the value you provide then why should anyone else? When we come up against a tough negotiator who uses aggression and even threatening behaviour, it’s easy to give-in to their demands and drop our price. Decide in haste, repent at your leisure. If you’ve enjoyed this extract, click here to buy the main book on Amazon.